Heel spurs are a common foot ailment that is often confused with plantar fasciitis. While the two are similar and related, they are in fact separate diagnoses. 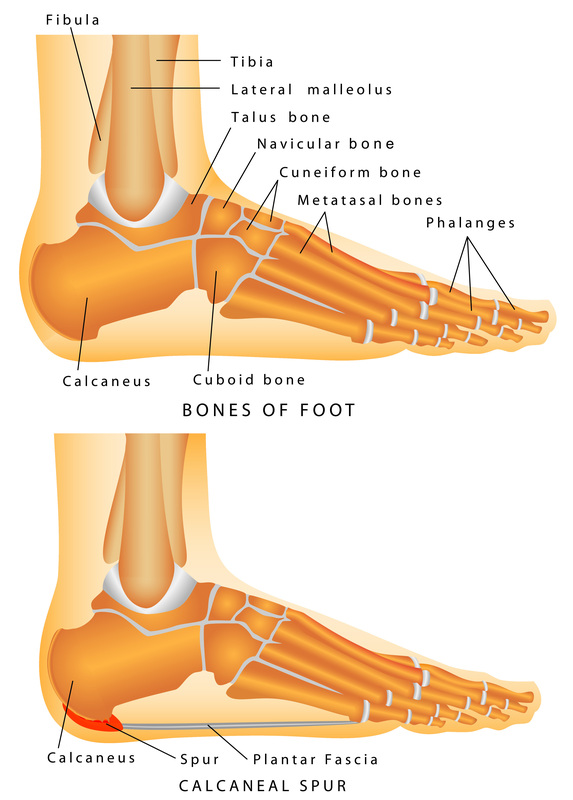 Heel spurs are hooked, pointed, or shelf-shaped calcium deposits that form on the bone. The heel spurs themselves do not sense pain, rather they protrude and prod the soft tissues of the heel, causing pain and discomfort. Heel spurs are a common ailment in patients who have a history of foot pain associated with plantar fasciitis. It occurs when the plantar fascia ligament, located on the arch of the foot, becomes fatigued, damaged, or inflamed. As this ligament is subjected to these stresses the body attempts to compensate through the buildup of calcium on the bone, leading to the formation of spurs. This is the body’s way of attempting to alleviate the stress on the worn ligament. Again, surgery is often times a last resort for patients who cannot find relief in the noninvasive solutions mentioned above. The Foot and Ankle Center at Orthopaedic Associates of St. Augustine have some of the best specialists and surgeons around. If you would like to make an appointment to treat or learn more about preventing and resolving foot pain, please contact us at 904-825-0540.